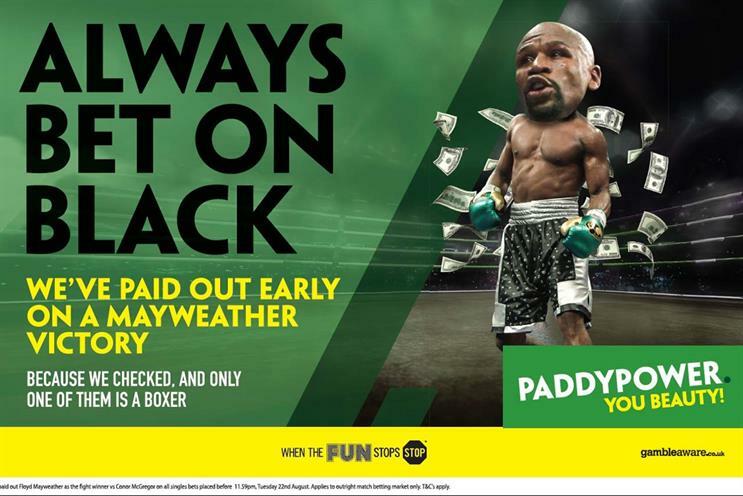 The Advertising Standards Authority has launched an investigation into a press ad for Paddy Power featuring a picture of boxer Floyd Mayweather with the headline "Always bet on black". Nine people have complained that the ad, which was created in-house and appeared in the Metro and the London Evening Standard, was racist and offensive. A further five complained about a Twitter post from the betting brand and a web page featuring the same image. The ASA said these were outside its remit as Paddy Power was based in the Republic of Ireland, but that it had referred these complaints to ASA Ireland. Mayweather’s fight against MMA star Conor McGregor, which took place on Saturday night in Las Vegas, was reported to be the most lucrative in the history of boxing. Paddy Power later said the ad was a reference to a line from 1992 movie Passenger 57. A spokesman said: "Like Wesley Snipes – who famously delivered the line – Floyd Mayweather is rightfully proud of his identity and, while the advert does reference his race, it does so in a manner which isn’t in any way derogatory or insulting. "It’s also a betting-related pun which references a roulette wheel. Because we’re about gambling – get it? If people don’t like it that’s entirely their prerogative." It is not the first time that Paddy Power has attracted complaints with an ad based around the physical characteristics of a sportsperson. In 2014, it achieved the accolade of the most complained about ad of all time, when, during the murder trial of Oscar Pistorius, the bookie offered "Money back if he walks".